Today’s four-minute screencast explores Office Live. It shows how to codelessly create a database table in the cloud, add data-collection and -display widgets to pages of an Office Live site, and then manage that data through the web and also from a remote Access client. To be clear, although Office Live Basics, which includes domain name and web hosting plus email service, is free, I made this screencast using the $20/month Office Live Essentials which adds contact management, document libraries, blog and wiki features, secure private workspaces, and the ability to create customized data collection and display as shown in the screencast. Among technical folk, the elevator pitch for Office Live is: hosted SharePoint. But that will mean nothing to many of the SMBs (small-to-medium businesses) that Office Live seeks to attract as customers. Which is fine because those folks don’t need to know anything about SharePoint. What they do need, but mostly don’t know that they need, is a way to manage public and private data in the cloud — but with an umbilical cord that connects back to the desktop applications they have and use. Although Office Live can in fact meet that need, it’s not obvious that it can. When Walt Mossberg and Joe Wilcox tire-kicked the service, they produced nothing more than a couple of brochureware sites, and I can hardly blame them. Although the data-gathering and data-display features of my otherwise brochureware-only site required no coding to implement, I had to use a lot of technical savvy to achieve the codeless solution. So, commentators — including Walt Mossberg and Robert Scoble — were shocked to discover that Office Live isn’t a hosted version of Office along the lines of Google Docs and Spreadsheets. Meanwhile, developers are scoping out the opportunity to build on the platform. And customers, so far as I can see, are mostly responding to free web hosting and email. Author Jon UdellPosted on 6 Apr 2007 6 Apr 2007 Categories . 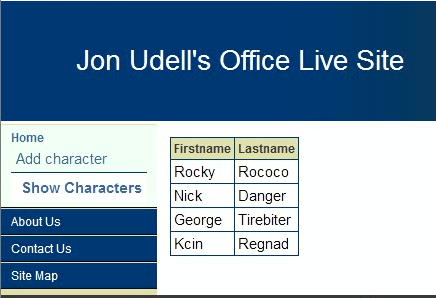 <> I can’t find any other references to Office Live having blogging features at this date. It seems like a critical feature. If it is available I’d love to find out where. It’s part of SharePoint. Not available in the free version of OL, I don’t think, but it is in the paid versions. Projjex.com is a great new site that does a fabulous job of project management & document sharing. It’s completely browser-based, really easy to use, and has a free version. Cool videos too – I love it! Previous Previous post: History or technology: Which is the better defense of identity? Both.